More fun, more family, more Crackpots, more snow. It should be great! Yikes! It’s a quilt top! In fact, it’s the Mystery Quilt, instructions for which were published in Quiltmaker beginning in the Jan/Feb 2007 issue. Crackpots may remember that Cathy started all this with her post in Nov., 2006 when she announced that she was planning to work on the mystery quilt and showed us her palette. Then I joined in. As I said way back then, I generally think mystery quilts are dumb. Why commit yourself to a whole lot of work on a project when you don’t know what you will end up with? But Cathy suckered me in. I thought – and still think – that it would be cool to have two Crackpots work on the same quilt and see how different they would be when finished. If you go back to our earlier posts, you will see that Cathy and I did indeed come up with very different blocks using the same instructions but our own unique choices of fabric. But the posts, and the efforts, petered out with the last post being from Cathy in July 2007. Cathy had the very good excuse of a certain adorable small James for putting her mystery quilt on the back burner, but I have none, except, of course, of having the responsibility of being grandmother to the aforementioned James. But then shortly after Christmas, as I was planning and packing for a visit to the Cute Little House, I was looking through my various quilting UFOs trying to decide what I wanted to take with me to work on and I came across the plastic shoe box with the bits and pieces and fabrics for the mystery quilt. Despite higher priority projects, something in it called to me, and I took it along. Soon I was hooked. And here you see the result. I like it!! Now all I have to do is layer and quilt it. It will be machine quilted in the ditch and shadow quilted. I’m not about to take on the task of learning free-motion quilting to quilt it as recommended in Quiltmaker. The current plan is to hang it over the couch in the Cute Little House. I just hope I can keep up the momentum. 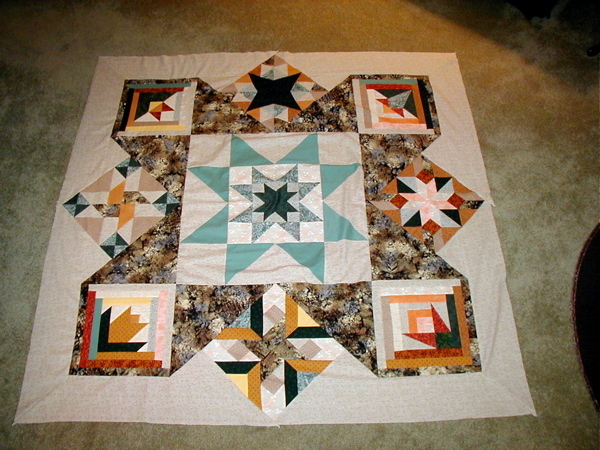 This entry was posted on Tuesday, February 3rd, 2009 at 10:49 pm and is filed under Mystery Quilt, Quilting Projects. You can follow any responses to this entry through the RSS 2.0 feed. You can skip to the end and leave a response. Pinging is currently not allowed. Very cool! Even though I saw all the pieces, I didn’t expect it to look like this. Those log cabin flower corners give it a three-dimensional effect.